Founded in 1921, Uesco Industries, Inc. (branded “Uesco Cranes”) is a family-owned-and-operated business located in Alsip, IL. The company is a leading manufacturer of custom-engineered crane and runway systems. Uesco’s OEM products include Single Girder, Double Girder, Top Running and Under Running Overhead Cranes, Single & Double Girder Dual Motor Gantry cranes in both Single & Double Leg configurations, and complete Runway Systems. Uesco’s extensive engineering department allows us to build custom overhead bridge cranes and runway systems to fit any application or environment. The company offers these products through a network of qualified and highly trained distributors throughout the United States. 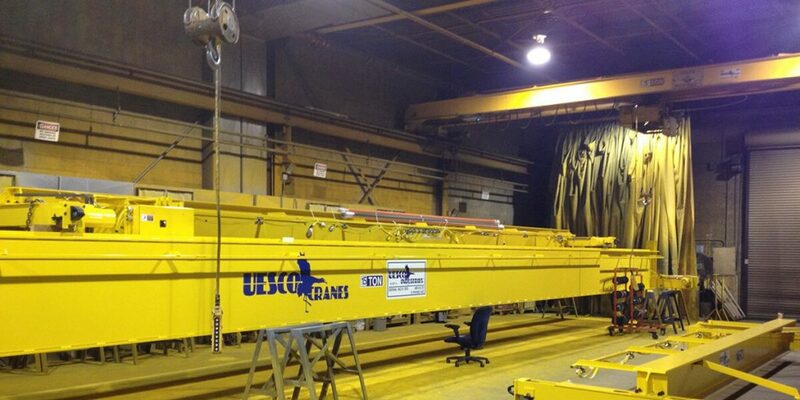 All of our cranes, end trucks, and runway systems are made in the U.S.A.
Uesco is also a master distributor for chain and wire-rope hoists, jib cranes, workstation cranes, under the hook attachments, radio controls, and all crane accessories from the top manufacturers in the world. In addition to their own “Uesco Cranes” Jib Cranes, some of the brands Uesco carries are CM, Coffing, Shaw-box, Budgit, Yale, R&M, Detroit Hoist, Harrington, ACCO, Stahl, Remtron, Magnetek, Gorbel, Spanco, Conductix-Wamplfer, Duct-o-wire, and many other OEM’s in overhead material handling. The company has an excellent service department with factory-trained technicians for installing, inspecting, maintaining, and repairing overhead crane systems. Uesco has one of the largest parts inventories around with 24-hour emergency parts and service available. Learn more about our company and commitment to quality and service in this short video.